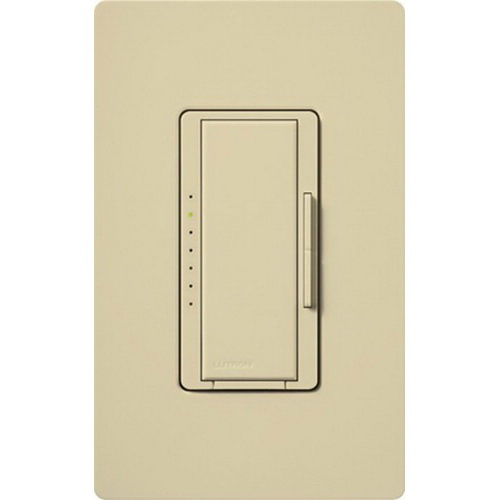 Lutron Maestro® Electronic low voltage dimmer switch in ivory color, has durable plastic construction with gloss finish. It provides true multi-location dimming from each location. This switch features touch rocker to adjust light level and delayed off provides light as you exit the room. The LEDs indicate light level and glow softly in the dark as a locator light. It supports maximum load capacity of 600-Watts and operates at a voltage rating of 120-Volts and temperature rating of 0 to 40 deg C. The dimmer switch meets UL, CSA and NOM standards.